This book is a sequal to Britain's Economic Prospects, the report issued in 1968 by the Brookings Institution and universally accepted as the most thorough and comprehensive study of the British Economy to have ever appeared. Two years later, just after the British General election, six fo the American economists who prepared the Brookings Report met with a number of other leading economists from Britain and the United States, at a weekend conference at Ditchley Park, to review the findings of the report. Papers submitted to the conference by four of the British Economists (R.C.C. Matthews, G.D.N. Worswick, E.H. Phelps Brown and M.V. Posner) covered the same ground as the Brookings Report - the role of demand management, trade and balance-of-payments problems, labour policies, and industrial policies. The conference also had before it a fifth paper, on fiscal policy and stabilization, which took issue with some of the views expressed in the Brookings report. These papers form the core of this book, which also contains an account of the conference discussions and concluding reflections by its Chairman, Sir Alec Cairncross, formerly Chief Economic Adviser to H.M. Government. 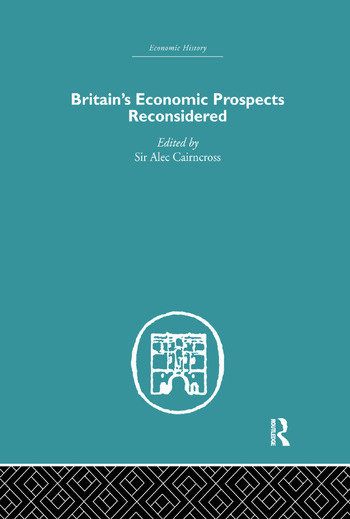 Britain's Economic Prospects Reconsidered is neither a detailed critique of the Brookings Report nor a rejoinder to it, but rather an attempt to reassess British performance and policies in the light of experience since devaluation. Its central concern is the question of why economic growth in Britain since the war has been slower than in other countries. This book was first published in 1971.